Rockefeller Arch and Denbigh Hall shown from 2 angles. 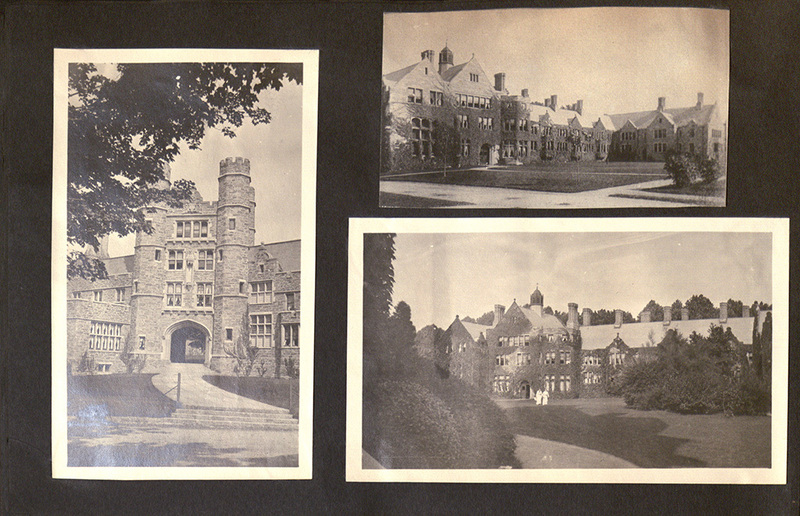 There are many images of Bryn Mawr's architecture, possibly as a point of pride. Initially, I was surprised that there were no descriptions or captions for anything in Passmore’s scrapbook. Living in an age where everything is labeled whether it be a tag on Facebook or a hashtag on Twitter, it seemed odd that there was no form of identification. Ultimately, this lack of captions indicates quite clearly what purpose her scrapbook served. It was to be viewed by close friends and family; people that would know what each photograph referenced. Furthermore, a viewer who has knowledge of the campus and its traditions has the advantage of not needing captions. While flipping through, I realized that I could recognize the buildings and events very easily but this was a privilege. It is amazing that a scrapbook of an alumni has the ability to extend over generations of Bryn Mawr women. Both sports and theater pictures are put together on one page even though they are not same thing at all, showing the relaxed attitude about the organization. “And so too would the scrapbook begin to move away from the decorative, perfunctory symmetry of the nineteenth century toward a more variegated form that recognized – indeed, celebrated – the individual idiosynchratic , and deeply iconic images of a new era” (xix). 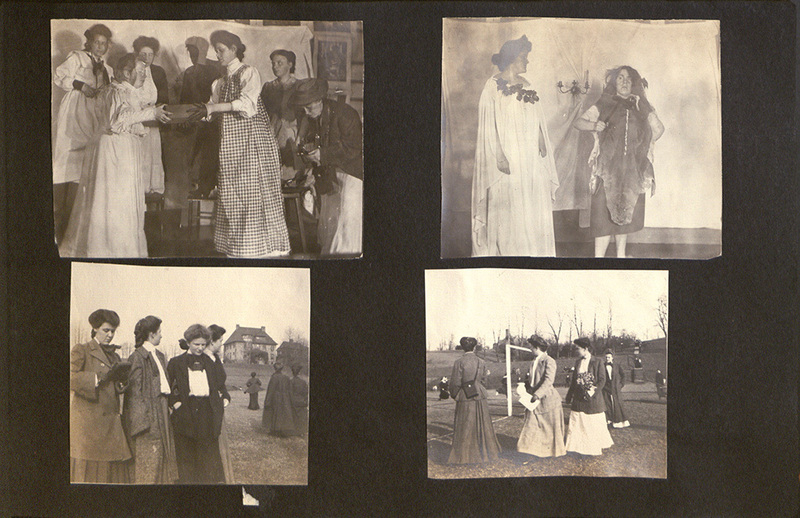 Passmore was making her scrapbook right after the turn of the century and it can be viewed as an artifact from this transition era. There are no real formal conventions followed in the scrapbook, but there is still the leftover sentiments of very formal pictures and scenes. This page has much more of a collage effect, rather than an ordlery way of displaying the images. 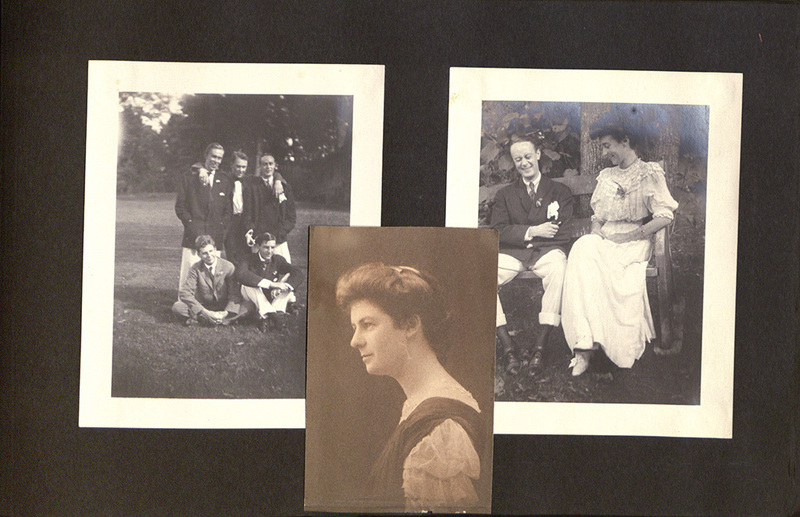 The group photos are most likely family members, while the center image is probably Frances Passmore herself.